The Gagliano family of violin makers in Naples, Italy spanned many generations and heavily influenced the Neapolitan school of making from around 1700 until the latter half of the 19th century. High quality workmanship was synonymous with the Gaglianos and this standard was upheld in the workshop Antonio Gagliano II (1778–1860) shared with his brother Raffaele (1790–1857).The brothers were the sons of Giovanni (Joseph) Gagliano and grandsons of Nicolo. proportion with the overall size of the instrument. Raffaele preferred to use a reddish-brown varnish. Antonio worked in the style of his brother Raffaele but showed a superior quality of workmanship in certain respects, such as the cutting of sound holes. However, his scroll work was less refined than Raffaele’s. Antonio’s workmanship shows conventional graduations of the top and back tables, and he paid great attention not only to high-quality tonal characteristics but also to the structural integrity of his instruments, which perhaps explains how they have survived the test of time. Antonio used an oil-based transparent amber-brown varnish, applied in moderate amounts. Both brothers also added a strong amber aloe underwash common to the Naples school of violin making.This they used with discretion to avoid the greenish tinge that can result from applying the solution too liberally. The brothers worked jointly on many instruments and this is reflected in the labelling of most of their creations as ‘R & A Gagliano’. THE INSTRUMENT SHOWN HERE is one of the finest examples of Raffaele and Antonio Gagliano’s joint-workmanship. It is a superior instrument showing exemplary craftsmanship and produces an amazing tonal quality.Also, most of the instrument is in its original form. Inside bears the makers’ label:‘Raffaele & Antonio Gagliano, Giovanni, Naples, 1846’. 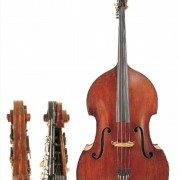 It is a modified 7/8-size, flat-back instrument with gamba-shaped corners. The top table is a five-piece sectional plate of vertical grain spruce ranging from wide character grain at the outer flanks of the top table to fine vertical grain at the centre joint.This sectional piecing of the top table is something I have seen in many Gagliano family instruments; it allowed the makers to use several smaller, high-quality pieces of top wood to make up the required dimensions for the top table. The back table is a two-piece sectional plate of highly-flamed maple, slightly descending from the centre joint.The ribs are of flamed maple of a similar character. 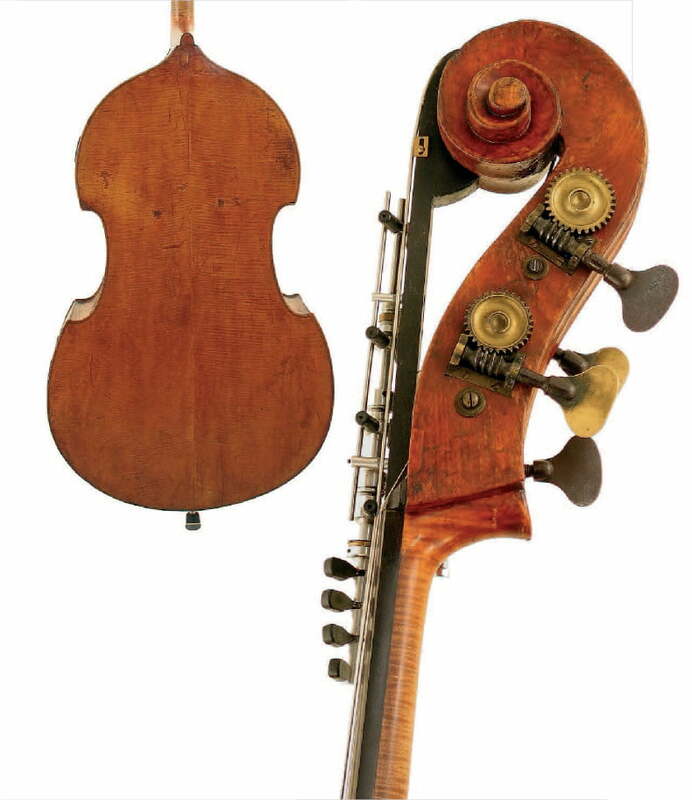 Using highly-figured maple, quarter-cut for a bass violin back, was not a practice followed by many Italian makers. I have evaluated a few instruments by the brothers Gagliano and the majority of these use this type of wood for the back. Older members of the Gagliano family generally used traditional woods cut on the slab, but they tended to choose more easily- accessible woods such as willow and poplar. Both the top and back tables are quite flat-arched, with minimal channel at the edges of the top and back plates.The inlaid purfling is expertly cut into the top and back tables, probably the work of Antonio. This purfling is made of beechwood and the two outer layers are stained, most likely with logwood stain.This is typical of Gagliano instruments and the Neapolitan school of violin making in general.The purfling is inlayed 5mm from the edge of the top and back tables. It is 3.5mm wide in total, with the centre section 2mm thick and the outer stained purfling layers both 0.75mm thick. The scroll is original, of plainer grain maple, and has an overall length of 38cm. 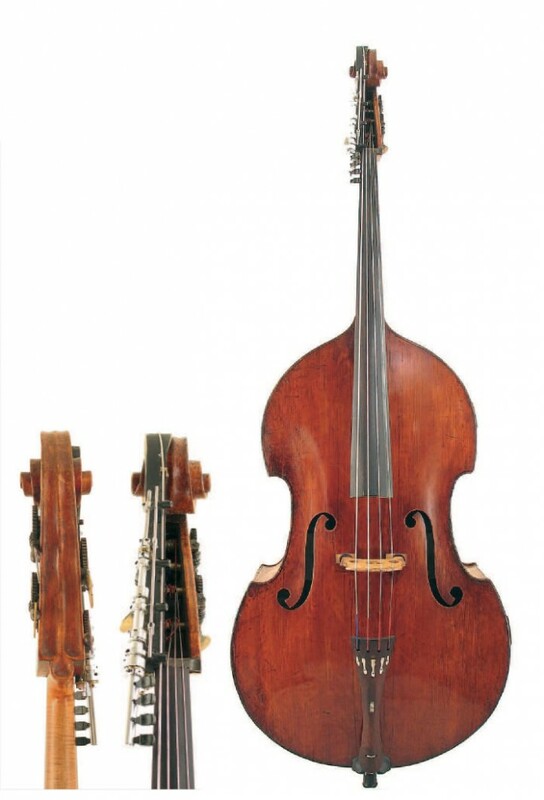 This adheres to the pattern of large scroll design characteristic of the brothers Gagliano and is a typical example of Raffaele’s workmanship, showing great boldness and a strong hand.The bass has a highly-flamed maple neck-graft from a later period. In general the external workmanship on this bass is quite refined, and the quality of the interior also shows that skilled hands were at work.The body has clear signs of the craft of Antonio Gagliano; the f-hole cutting and varnishing also correspond with his style of making.This bass retains its original varnish, which is an amazing transparent brownish-amber colour and shows great quality. The gears are individual brass inlaid tuners, possibly of Italian origin, and the tuning knobs of the gears are unplated cast iron. Overall the instrument is wonderfully preserved, with strong, even projection across all registers and an exquisite, mellow tone. This fine bass is presently in the Kolstein collection in NewYork. The author would like to thank his colleague, Stefano Pio of Venice, for contributing information to this article.